Is Luke Goodrich of Becket Lying? – Kent Hovind v. Robert Baty – The Great Debates! Home→Is Luke Goodrich of Becket Lying? About 10 years ago I recommended to Annie Gaylor of the Freedom From Religion Foundation (FFRF) that she, the FFRF, take up where Erwin Chemerinsky left off and legally challenge the constitutionality of Internal Revenue Code Section (IRC) 107 that allows ONLY “ministers” income tax free housing benefits. The FFRF did take up that effort. In the most recent action, Judge Crabb of the Federal District Court of Wisconsin ruled that IRC 107(2) is UNconstitutional. Notice of appeal was filed last week by some intervenors being represented by Becket, a religious, legal activist organization. I believe that statement to be false; a lie if you will. 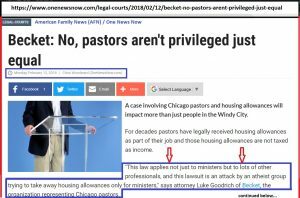 I figure anyone familiar with the law, as Mr. Goodrich should be, should know that, in fact, IRC 107 ONLY applies to “ministers” and that everyone else has to comply with more restrictive tax benefits allowed for housing without regard to the invocation of “minister” status. I have written to Becket and to One News Now for a response to my claim. I will try to update this page if responses are received. In the earlier Wisconsin case in which Judge Crabb ruled that IRC 107(2) was UNconstitutional, there was a deposition of Annie Gaylor. Following are excerpts from that deposition which bears on my opening comments above. the tax, of the IRS. the parish exemption, for example. There was a case involving a school. Any information not come from the media? I guess–I am trying to remember. Who gave you the particular case? not to answer, you have to answer. answering the question, so if you can answer. don’t know if you know Mr. Baty or not. any secrets with Bob’s name. was mostly just by emails. Well, that he thinks this is unconstitutional. How often do you email with Mr. Baty? Well, he gave information that was helpful. in terms of document productions in the future. Subject: Re: Challenging IRC 107; ministerial housing allowances! Thank you for your intriguing e-mail. My question would be: who would have standing to sue, since the Hein v FFRF ruling? It would have to be in federal court, since it’s a federal law, if I understand this correctly, and if federal taxpayers would not be able to pursue it, who would be an injured party? I could possibly see a neighbor of a “rectory” who might be able to prove they paid more taxes when the “rectory” went off the tax rolls? But such a plaintiff might be very hard to find. I can pass on to our attorneys but a little more information on how you would see this lawsuit proceeding would be most appreciated. Some have long held the position that IRC 107, the tax law allowing “ministers” to receive housing allowances tax free, is UNconstitutional. However, to my knowledge, there has not been an appropriate challenge to test the theory. Erwin Chemerinksy, as amicus in the Rick Warren case, had indicated that he was intending to mount a legal challenge to IRC 107. Chemerinsky recently advised me that, while the project was worthwhile, he no longer had the time to puruse it. So, I’m wondering if your organization might take up the project or be able to recommend an organization or individual that would. I would like to see the project pursued. Any attention you are able to give to the matter and this inquiry will be greatly appreciated.